ELKHARD LAKE, WI (Aug. 4, 2016) – American paralyzed BMW driver Michael Johnson has few things he loves more than driving and being able to drive to his races from his hometown. 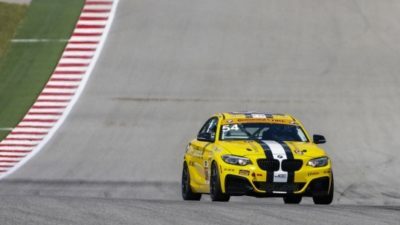 The Michigan native is gearing up for this weekend’s Continental Road Race Showcase at Road America in rural Wisconsin as part of the Continental Tire SportsCar Challenge series’ aggressive summer schedule. Johnson and his co-driver, Cape Town South Africa’s Stephen Simpson, will take to the 4.048-mile, 14-turn road course during official open practice on on Fri., Aug. 5 at 8:00 a.m. and qualifications later that day at 3:45 p.m. The two hour, thirty minute race will be contested on Sat., Aug. 6 at 11:35 p.m. (All Times Central) to close out the weekend. Their BMW is of course specially equipped with hand controls, provided by GuidoSimplex, due to Johnson’s paralysis. The car features a complicated brake, gearshift and throttle system, with which Johnson uses his hands to control systems other drivers manipulate with their feet.